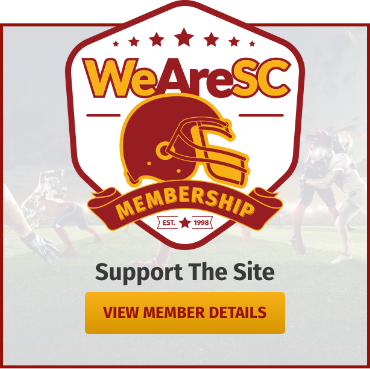 WeAreSC’s Monday Mailbag addresses questions about the next offensive coordinator target, finishing the 2019 recruiting class, and practice philosophies. Q: in2nation: Any rumors as to our next OC target? And does he bring a RB coach? Does that dictate filling OC first, then QB and RB coaches? 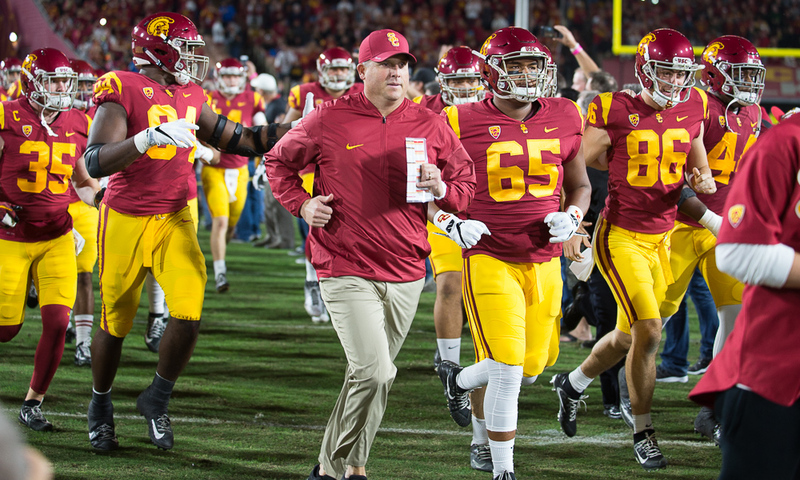 A: Erik McKinney: One constant we’ve seen from Lynn Swann and Clay Helton during various hiring situations is that there haven’t been many leaks or hints about upcoming decisions. Obviously there have been names tossed out as options—Rams offensive assistant Jedd Fisch, North Texas offensive coordinator Graham Harrell, former Houston head coach Major Applewhite to name a few—but there doesn’t seem to be that momentum rolling towards a definitive No. 1 option like there was when Kingsbury was available. We’ve certainly seen that Helton is comfortable hiring an offensive coordinator and letting him bring his own running back coach, but that was with Kingsbury, who was likely going to take over just about every aspect of the offense. It now remains to be seen whether Helton brings in another offensive coordinator he respects enough to give that kind of autonomy over the offense. Q: KeepCalm&FightOn: In your opinion, what are the chances CH plays it safe by making Tim Drevno OC & Oline coach and also retains play calling next season? A: Greg Katz: It’s safe to say in his overall selecting of assistant coaches, Clay Helton is not much of a risk taker unless pushed. In terms of promoting Tim Drevno to OC and play calling, if Helton did promote Drevno, you can basically forget about the Air Raid offense since Drevno cut his brand around former employer Jim Harbaugh, who believes in power football and a balanced offense. 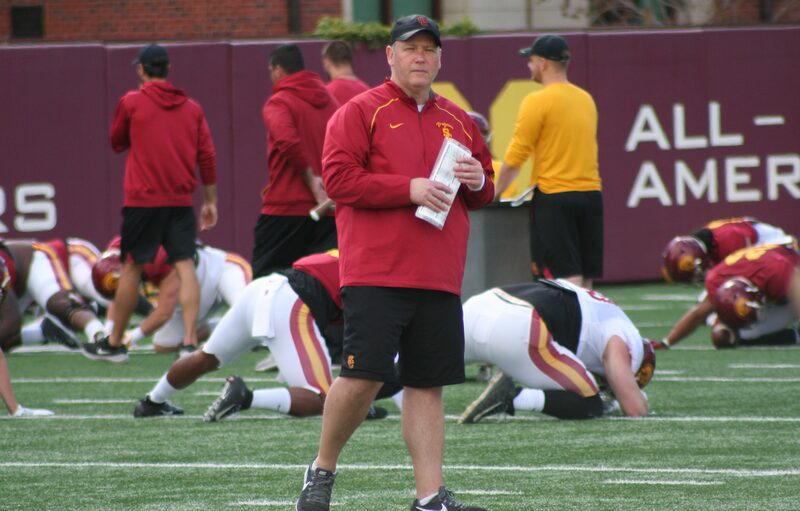 The good news is that Drevno understands power football and that is what Clay Helton says he wanted to do in the past, although there is open debate to whether that actually has been put into practice. Drevno has been an OC before at Michigan, which didn’t turn out to be a success or he’d still be at Michigan. So would Helton promote his offensive line coach to the OC and play caller? I could see him doing it, but I don’t think that the play calling aspect would be all that much different if Helton has a big input. in fact, I’ll go far enough to say that it’s the play calling that has been the biggest challenge in the Trojans’ offense, in addition to the weekly practices that don’t lend itself to power football or physical play. And there’s one other problem with giving Drevno the OC and play calling. It means that a new quarterback coach would probably have less authority or input into the process. 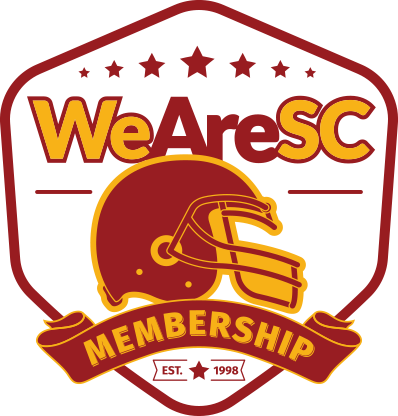 Q: motovich: Any rumors on commits/recruits that are unhappy with all the USC drama and are looking to have their commitments rescinded or looking elsewhere? How do you think the rest of the class fills out? Thanks. Q: USCVel: Are the coaches targeting any OL or DBs to round out this class and, if so, care to speculate on our chances of landing them? And are you concerned that any of our unsigned commits on offense will reconsider due to KK’s departure? A: Erik McKinney: Of the signed commitments, I would be hugely surprised to see any of them try to back out of their letters of intent at this point. While keeping Helton and Kingsbury leaving are huge message board topics, the recruits specifically signed knowing Helton would continue as the head coach, and I doubt there’s a USC-level recruit in the country who hasn’t seen some kind of coaching upheaval from at least one school recruiting them. At this point, the three unsigned commitments—running back Jordan Wilmore and wide receivers Kyle Ford and Puka Nacua—are definitely in play for other schools. Wilmore took an official visit to Utah this past weekend and the Utes will likely be in play for him all the way up until he finalizes his decision. Ford will get pushes from Oregon and Washington, while Nacua will hear from BYU and Utah. But these are just typical recruiting battles at this point in the cycle, where USC has to protect their commitments as other team continue to chase. As for rounding out the rest of the class, I would hope it’s done with linemen and additional help in the secondary. I do think USC eventually lands offensive guard Enokk Vimahi, who registers as a “must get” at this point in the process. But after him, things are getting interesting. Offensive line targets are dwindling, as Dawand Jones appears to be Ohio State’s to lose, and few targets are remaining. Defensive back Noa Pola-Gates is trending toward Nebraska at this point, and he could wind up another defensive back to spurn USC, after the Trojans failed to flip Chris Roland from Arizona or Mark Perry from Colorado. At this point, it wouldn’t be a shock to see the Trojans go back to Sione Vaki as an additional safety in this class. And Arkansas cornerback commit Adonis Otey is scheduled to take an official visit to USC in February. Defensive tackle D’Von Ellies would be a surprise addition considering Penn State is considered the strong leader. Overall, this is a good class already, but it’s far from perfect without the addition of a few more big bodies and another one or two cornerbacks or safeties. A: Erik McKinney: I don’t know if any media member has asked Helton that question, but he did have a chance to talk about the end of “No Pads November” last year, when he said the seniors wanted to continue practicing in pads through the end of the season, rather than giving them up for the last four games as they’d done in the past. I believe that’s the third time in three years that there has either been a players-only meeting or players coming directly to Helton to discuss a change in practice mentality. But it’s important to keep in mind that the Pac-12 instituted a rule that teams can only practice in full pads two times per week, so people hoping that USC will start showing up in full pads every day are always going to be disappointed.